Who owns that consumer brand? Home › Branding › Who owns that consumer brand? Recently there have been another spate of questions on Quora and other online forums about product brand vs company brand, especially from new marketeers or entrepreneurs wrestling with these issues. Admittedly it is different in small startups from the big consumer brands, but it always amazes me that they don’t just look around their own kitchen or bathroom and read the labels. They might also be surprised where some of their goods are produced. In fact, in this day and age of mega mergers, takeovers, buying and selling of brands, you can even do this exercise each year and get different results. But in the meantime, consumers remain loyal to the names and brands they trust. I had occasion to try this recently myself as I reached for the curry the other night. 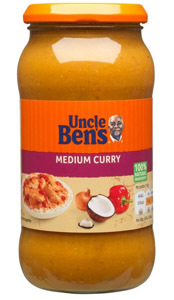 I never would have guessed that my favorite Uncle Ben’s curry was actually owned by Mars Foods UK Ltd (aren’t they the well known US candy company?). Plus my particular bottle was made by Mars Foods Ireland. Wow, Irish made ethnic food with a very ethnic name! By the time I eat it on the West coast of USA, some of the ingredients, like coconut and curry powder and peppers, must have traveled a few times around the world.